TOTO is a name brand that many people associate with their toilet. It is one of the biggest brand names around and with each new toilet that is released, their name becomes a little more impressive. They design toilets for the way we live today. 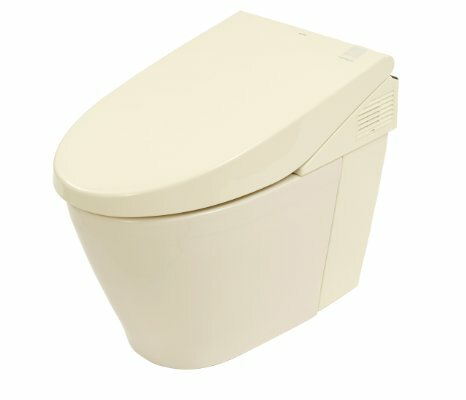 As proof, you should take a look at our TOTO Neorest 550 toilet review. It is guaranteed to be unlike most all other toilets that you have seen. The Neorest 550 is just a step up from the Neorest 500. This toilet is able to fit well into any bathroom in your home. It is not as large as most other toilets but it certainly ranks among the best toilets available in the world. It does not feature the traditional stand and tank that most of us have in our bathrooms. It is just a single piece toilet that can fit just about anywhere that you want to put a toilet. The toilet measures 26.5” long. The bowl rim height is 14 3/4 high. With the included seat, that height stretches to 15. 1/2” to make it easy to sit on for most people. From the floor base to the top of the toilet is only 21 3/8” and width is 15 5/16”. 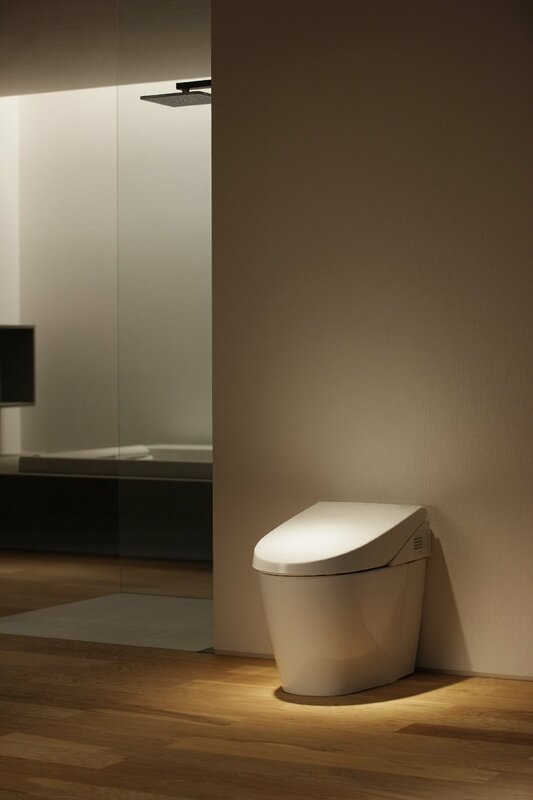 The Neorest 550 features a programmable toilet nightlight so that you do not have to turn on the light to answer nature’s call in the middle of the night. 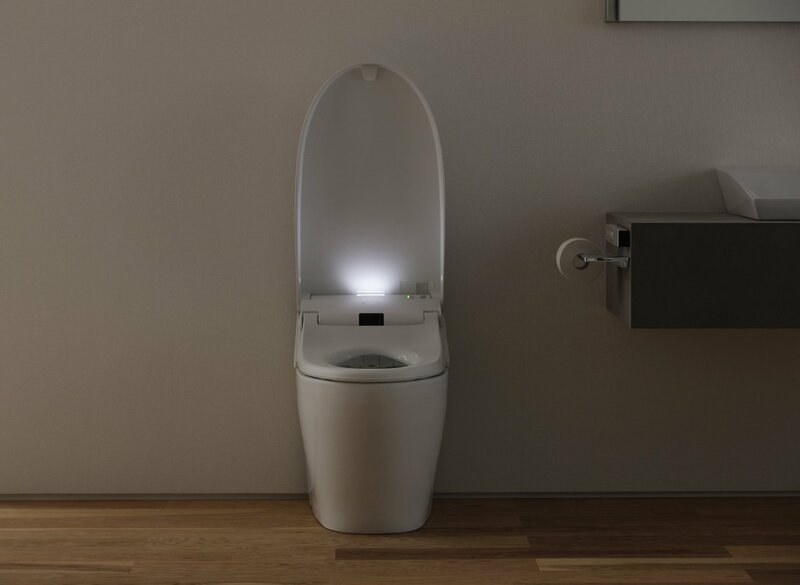 It automatically lights up when the toilet lid has opened so that you know exactly where to sit. Another automatic feature of this toilet is that the lid will automatically open and close when it senses that there is movement within your bathroom. It can also open by pushing a button on a remote during the nighttime hours when the sensor may not easily detect movements. Can you imagine never again having to ask someone to put the lid down on the toilet in your home again? It flushes automatically as well. This will ensure that children never forget to flush away their waste when they are finished using the bathroom. It keeps the toilet cleaner for a longer amount of time which makes life easier, and more sanitary, on everyone. This toilet is designed to conserve water. You can select the amount of water that you want to use with each flush. You can set it to use only 0.9 gallons per flush or 1.6 GPF. Whichever you choose, it is a guarantee that you will save money per flush on your water bill. This is definitely one of the best dual flush toilets. If you are worried about the cleanliness of a toilet that uses only 0.9 gallons per flush, you should take into consideration the fact that it is coated with TOTO’s patented, super-smooth, SanaGloss coating. This coating ensures that debris cannot attach to the inside of the toilet bowl and dirt will not attach to the outside of it either. The Neorest 550 also provides you with a Washlet cleansing option. You can use it to freshen up after visiting the bathroom. It can be set to spray using three different modes so that you can always feel comfortable about your body’s cleanliness as well. Most current owners say that this is the toilet of their dreams. They love that it can handle anything that comes its way. They enjoy the fact that everything has become easier in the bathroom thanks to this outstanding toilet by TOTO. The only real problem mentioned by current owners is that the plumbing in your home must be adequate for this toilet to function properly. The water supply line for your new toilet needs to be approximately 3/4 inches and line up properly for the toilet to flush the way it is supposed to. This is a little different from your standard home toilet and means that you may have to have a little plumbing done. You should also know that there is a filter within the toilet that can become clogged. However, it is easy to clean if you begin to have difficulties. Is The Toto Neorest Worth It? The price of luxury is quite high with this toilet, but when you consider all that it can do for you, you may decide that it is definitely worth considering. Most current owners love the functionality of this toilet and definitely consider it something worth trying. Therefore, if you have the extra money to invest in cleanliness and want something different for your bathroom, you should consider the TOTO Neorest 550. Ready to Buy the Neorest 550?